Siddhartha Khemka of MOSL believes the environment does not support companies with poor corporate governance. NEW DELHI: Allegations and counter-allegations between ADAG group and two of its lenders, which last week offloaded pledged shares of the group, continue to dominate the buzz on Dalal Street. Market regulator Sebi is now said to be looking into the issue, even as ADAG stocks have already eroded over half of investor wealth. Analysts said emergence of corporate governance issues has hurt market sentiment badly of late. Investors have become suspicious of every company, where promoter share pledge is high. On Monday, shares of Apollo HospitalsNSE 1.34 % plunged 11 per cent over similar concerns after news reports said the promoters had pledged additional shares to the tune of 5 per cent holding. 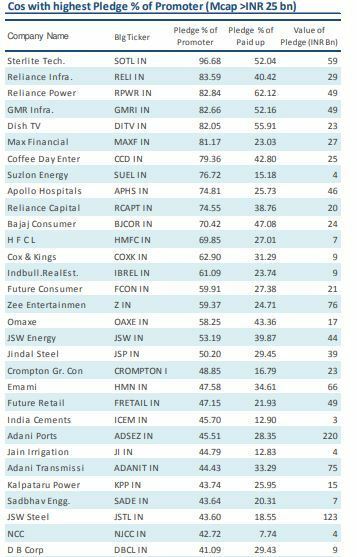 As shares of companies with high pledged shares drop, lenders are invoking the collaterals, leading such stocks to fall further. Avoid stocks of companies where the levels promoters’ share pledges are high, analysts said. In the case of ADAG, one of its lenders, Edelweiss, said it reached out the group numerous times to make up for the drop in the valuation of collaterals. It said the group continued to breach contractual obligations and did not reply to an offer for remediation. ADAG claims the lenders’ move to execute huge sale orders at a much below market price was illegal. The ball is in Sebi’s court now. If one were to go by available data, promoters of 2,942 BSE-listed companies has over Rs 2.14 lakh crore worth of shares on pledge as of February 12, 2019. There is nothing unusual about pledging shares. 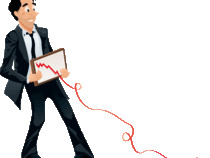 Promoters usually offer their shares to provide additional collateral for maintaining debt lines or infuse capital in other promoter entities. But in cases where share pledge is done to fund other business interests, it becomes a little risky, more so when such businesses underperform and do not generate cash flows, said Elara Capital. “Given the expectation of enhanced volatility and tightening liquidity, we recommend investors to avoid high-beta stocks; and stocks with increasing share pledges and declining promoter holding,” the brokerage said. In the case of Essel, the shares that promoters pledged with its lenders increased over time. Group Chairman Subhash Chandra in an open letter said it was his ‘obsession’ of not walking away from any situation that made him bleed up to Rs 5,000 crore. “Despite the loss-making projects, we continued to pay interest and principle by borrowing funds against shareholdings in listed companies,” he said. An allegation over corporate governance (the group companies’ alleged linkage with a company under SFIO lens), which the Essel group strongly denied, pulled down the group shares. A few lenders invoked pledged shares in knee-jerk response, but the group eventually managed to secure time from its lenders to monetising non-media assets and pay back dues. “Shares are getting corrected where the promoters had resorted to brisk borrowing. People are associating this with corporate governance, which is technically not correct. If you look for shareholding-related issues, share pledges will feature now. The important thing is to see the actual corporate governance in terms of whether promoters are being ethical in their management and fair in their business practices,” said Sunil Subramaniam, MD & CEO, Sundaram Mutual Fund. He said corporate governance issues are new and will take time to play out. “I do not think we have seen the end of this yet partly because I think the promoter holding being pledged and being used to finance investment and other things is a very widespread phenomenon. You only had two or three which have come out,” Subramaniam said. Siddhartha Khemka of MOSL believes the environment does not support companies with poor corporate governance. “In a bull phase, the market tends to forget a lot of these and try to find value even in names that are bad. Even large cases have emerged. We saw that happen in Zee. 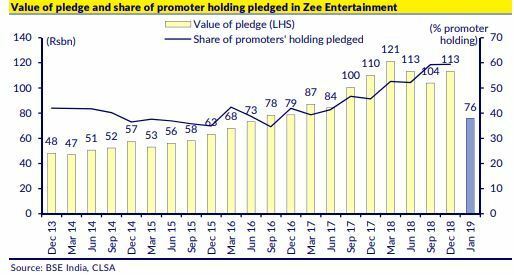 Although there was no corporate governance issue, the promoter share pledge led to market-cap erosion. New names too are cropping up, where the promoters are coming up with things not expected from them. Jubilant is a case in point, where the promoters sought royalty. One needs to stay away from such names,” he said. Deven Choksey, MD, KR Choksey Investment Managers in an interview to ETNOW said it is the right of any investor, including promoters, to pledge his share and raise the money. Bu the problem in this entire situation is that the transaction is taking place outside the market. “You are pledging double the quantity of money that you have borrowed with the lender. And the lender probably in a given situation, in order to recover the money, would sell the quantity, bringing the price down of that particular stock. Borrowing, per se, is not fundamentally weak. The problem is with the market system. You need to bring the lender and the borrower on the same platform on which the lending of money would take place from the market platform. It should not happen that one or two NBFCs end up giving whole money to the borrower and in turn the borrower would remain in the clutches of the particular lenders,” Choksey said. Stocks 2, 942, All, are, pledges:, Promoter, share, stocks, these, untouchable? Next Next post: Is Your Integrated Marketing Campaign Truly Integrated?